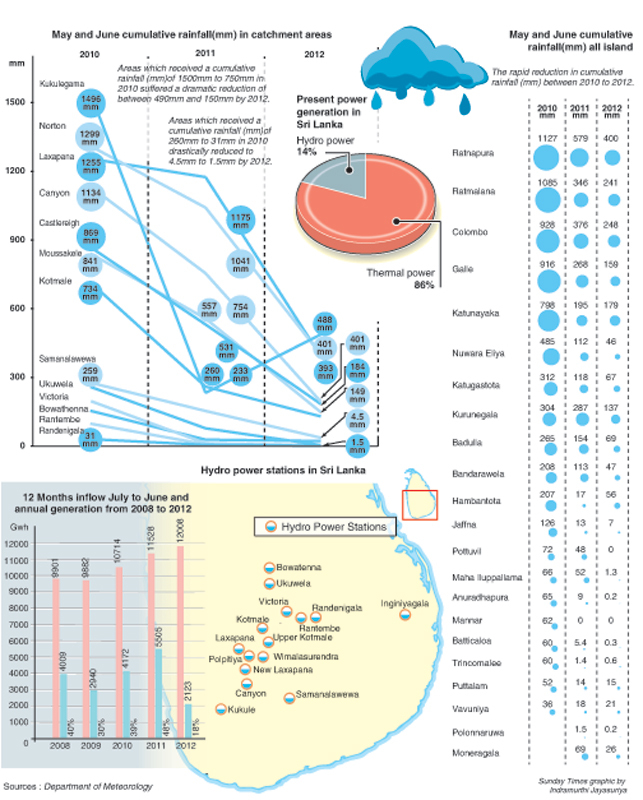 Sri Lanka’s private sector power producers were responsible for 43% of power demand fulfilled in 2011, up from 40% the year before and less than 10% in 2000, according to a recent report on the industry published by ratings agency RAM.� Further, the country’s reliance on, mostly thermal, private sector power producers is expected to grow even more in the short to medium term due to the government’s focus on “long-tailed nature investments” which would result in an eventual shift to thermal from the Ceylon Electricity Board’s current, mostly hydro power generation capacity, particularly with the latter experiencing capacity constraints as a result of poor rainfall island-wide. According to RAM; “The country’s [private sector power producers] comprised 115 producers as at end-December 2011, with 90 players focusing on mini-hydro power. That said, in terms of power generation, thermal sources accounted for nearly 86% of total units in 2011, given the high capacity of these plants. Despite its high cost, the rising demand and the lack of diversity in Sri Lanka’s energy resources will compel the nation to rely more on thermal power, which is expected to contribute increasingly towards satisfying the country’s power requirements going forward”. The report also noted that the government’s major power projects currently underway will likely increase power generation by 44% by 2016, and, by 2022, thermal will take over power generation for the country, with plants being fueled mostly by coal, at 72.8%, as well as gas turbines, at 6%, and petroleum, at 3.7%. Rains in hydro power catchment areas bring some relief: Met. Dept.